As per expert analysts, the global soy protein concentrate market is expected to garner a 4.6% CAGR from 2017 to 2016. The market is anticipated to reach a valuation of US$2,200 mn by the end of the forecast period. In terms of applications, the global soy protein concentrate market is segmented into meat processing, animal feed, bakery and confectionary, and other applications. The meat processing and animal feed segments are expected to dominate the market owing to high demand. They are expected to retain their position throughout the forecast period. On the geographical front, Asia Pacific excluding Japan and Europe are anticipated to hold a major share in the global soy protein concentrate market. This is owing to a rise in living standard and an increasing preference for healthy foods. Moreover, a booming food and beverages industry has stimulated the market’s growth in this region. In recent times, there has been a tremendous growth in the food industry owing to the development of new food manufacturing techniques. Moreover, there is a rise in demand for food manufacturing using natural sources. This has played a key role in propelling the growth of the global soy protein concentrate market. Additionally, a rising preference for foods with high nutritional value has driven the market’s growth. 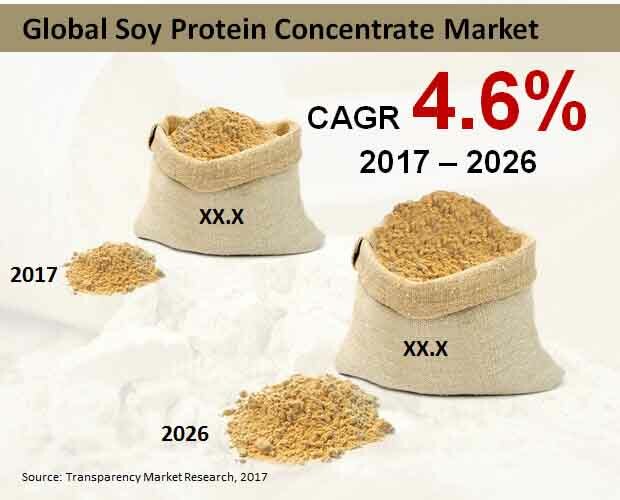 Further, a rise in per capita income and surging demand for packaged food as ushered the soy protein concentrate market’s growth. Furthermore, soy protein concentrate is extensively used in breakfast cereals, baked foods, and meat and poultry products to enhance their nutritional value. This has impacted the soy protein concentrate market positively, thereby expediting its growth. Moreover, emerging animal feed industries have considerably driven the industry’s growth. Another factor driving the market’s growth is the high demand for cost effective meat alternatives. On the downside, there are a few hindrances that may restrict the global soy protein concentrate market’s growth. Factors such as lack of awareness about the benefits of in the underdeveloped regions may cause a shortfall in the market. Nonetheless, a rising number of vegan population and growing prices of meat may offset the effects of the restraints. Moreover, increasing awareness about plant-based foods will drive the global soy protein concentrate market’s growth. Food processors and manufacturers are emphasizing of new product innovations using product formulation changes. This has resulted in the production of products such as GMO-free soy protein concentrate, thereby presenting new growth prospects for the global soy protein concentrate market. Furthermore, researchers have linked the consumption of soy protein to reduced risk of breast cancer. Additionally, it aids in lowering the level of LDL cholesterol, thereby reducing the risk of heart disease. This has further aided in creating new avenues for the global soy protein concentrate market.